photo courtesy of QuincipleSometimes you don't need the shortcake to serve fruit and cream. If it's too hot to turn on the oven, or you are short on time, just serve them up without it. Layer berries and whipped cream in glasses if you want it to look fancy, or present generous bowls for guests to serve themselves from. Chantilly cream means it’s whisked just until you could call it whipped cream, but it still falls over in soft folds. With a hint of vanilla and sugar, it’s divine. A splash of vinegar and a spoonful of sugar make strawberries taste more like themselves; like tasteful makeup can make a beautiful face radiant. I like the slightly unexpected savory fragrance of basil with this, but mint is nice too. A version of this recipe will appear in Quinciple boxes this week. Trim the tops from the strawberries and cut them in half. In a non-reactive bowl, toss the halved berries with the best red vine vinegar you can find (within reason), 2 teaspoons sugar (more to taste), and a pinch of salt and freshly ground pepper. Let them marinate for 20 minutes to a few hours in the fridge. In a large bowl, whisk the cream until it froths. Add a teaspoon or two of sugar. Continue whisking until it holds very soft peaks that flop over immediately. Stir in the vanilla. Do not over-whisk or it will get dry and buttery. Stack up the basil leaves and cut them into chiffonade–the thinnest possible strips. Assemble the dessert immediately before serving. 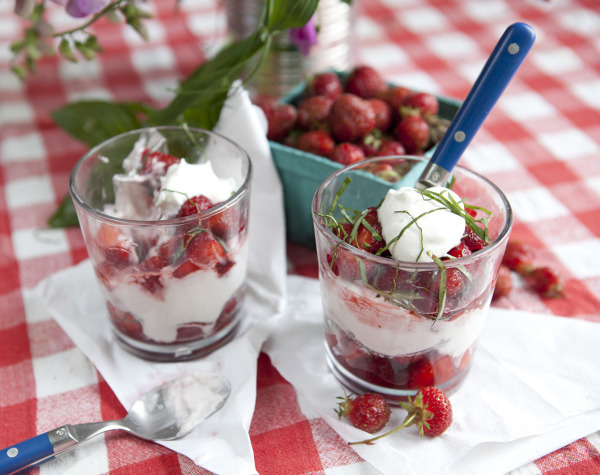 Present the strawberries layered with whipped cream and and basil chiffonade.